The late 1950's though to early 1960's was a good time to grow up in New Zealand, particularly in a small town such as Whakatane. Located in the eastern Bay of Plenty, and only an hours drive from Tauranga and Rotorua, it was still far enough off the major highway to retain a small town image. 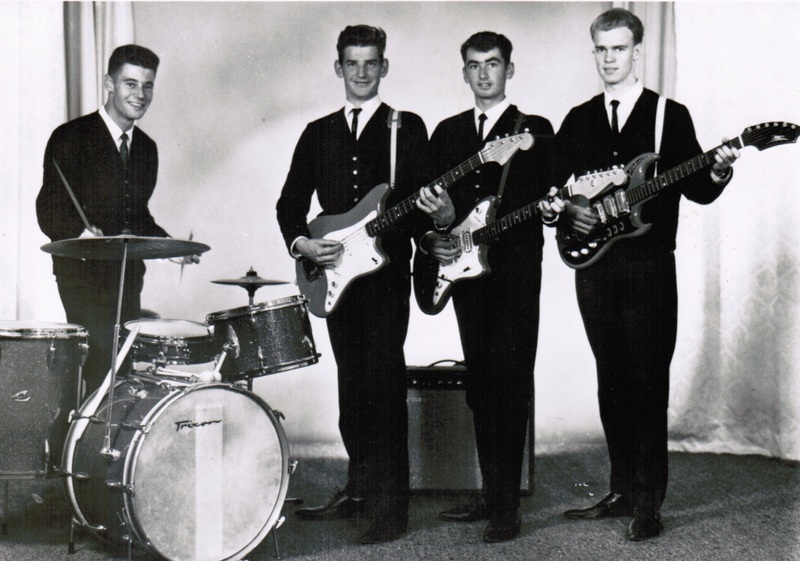 The Nomads Rock & Roll Band was as fondly remembered as a "legend in their own minds", was comprised of Dave McArthur, John Perham, Jack Howat, Peter McArthur, and Malcolm Anderson. We all met at high school and Dave and John were a duo for several years learning to play guitar and somehow manage wth the barest of musical theory. With the addition of Jack a few years later, the Nomad Band was born. We ended up playing for a couple of high school dances and a lot of football club bashes along Valley Road most weekends. I think the going rate was 10 quid for the three of us plus beer! 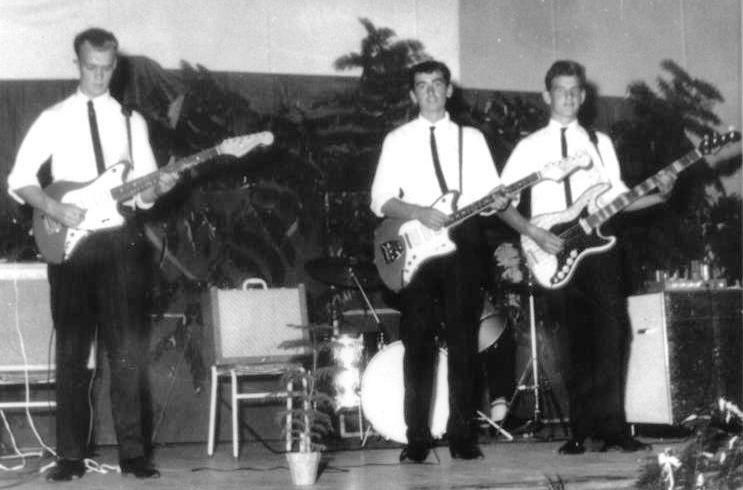 The music of the time was mostly instrumental with guitar solos, modeled after the Shadows, the Ventures, and various British and US groups popular at the time. Honky Tonk and Guitar Boogie were the big standards for budding guitarist to cut their teeth on. In 1963 the Beatles and the Mersey sound arrived from the UK and the NZ music scene became alive. Overnight we became a vocal group with a strong repertoire of Beatle songs, along with the Rolling Stones, Kinks, the Animals, Manfred Mann, and lots more. We knew all the songs, we even had Beatle style jackets and Chelsea boots! Brother Peter had joined us by then on drums, with Malcolm on lead vocals. 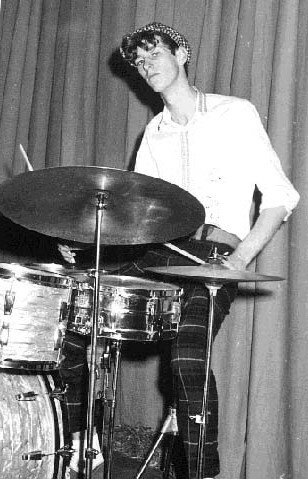 An older friend Don Hague had drummed for us for a year or so, which instilled some badly needed discipline amongst us. Don's background was in dance and and swing music. Andy was a mate who always was with us, singing all the songs, so he eventually graduated to the front line. The Nomads were now a band and the lineup was complete. Elder brother Richard and his mate Bob Mckay opened a restaurant lounge named "The Wedgewood" in town and the Nomads became the house band, which played Friday and Saturday nights. From memory, the music was a bit of a rabble the first couple of months until we acquired some order and discipline. (that term again). There were only a couple of other bands in town at the time, so with working the Wedgewood Lounge and the football club bashes, 21st birthday parties, weddings and such, we were quite busy. We even played waltzes and foxtrots. The Ohope Beach Domain Board approached us to do the beach dances for them, a contract which spanned nearly four weeks of playing every night over the holidays. The dances were packed with young kids over Xmas and New Year, as there were two camp grounds at Ohope Beach. Quite a tough grind for a young band. Needless to say, copious amounts of beer were consumed to deaden the pain during this period. This period of performing did hone up our musical abilities, and we became a tight cohesive group. Also at the beach was a milkbar/dance hall which featured bands throughout the year. I don't remember if the Nomads ever played there, but I do remember seeing John Rowles and his band the Kawerau "Shadows" play the Cabin more than once before he made it big in Australia and the International scene. He was resident at the Royal Hawaiian in Honolulu for many years. His brother Frankie Rowles, also had some success as an entertainer. Alas all things come to an end, and sometime into the next year the lineup above began to breakup and go on to other things. Andy got married and went to Kawerau, John went to Te Puke, Dave to Rotorua. Jack and Peter remained and quickly hired new musicians to fill the lineup so the Nomad legend could carry on. With newcomers Paul Curtis on lead vocals, Red Miller on guitar, Lynn Rea on bass, and Alan Moon on keyboard, the new Nomads Band was born and began taking care of business. Red Miller was at least four years older than us, and had played in a number of bands in town for some years, and was probably a moderating influence on the new younger members. The Nomads started running their own dances and retaining the profits. I remember the band owning a decent sound system at that time, a Vox keyboard, and other equipment. By then the live music scene had changed. The Mersey Beat was in full swing, and larger nearby towns like Tauranga, Rotorua, and Hamilton, had night clubs which catered to our age group. Auckland had an amazing amount of live music clubs for it's population, all mainly gathered within a ten block area. The days were gone when the Keil Isles and The QuinnTikis dominated the live music scene. From memory, Jack and the Nomads performed at the Battle of the Bands contest, and came in either 2nd or 3rd. Paul Curtis fronted the band and went on to form other bands in later years. Peter retired from drums and went to Canada to join brother Dave (remember him? ), Jack went to Uk and West Germany where he played in an Irish band for years, Alan died, and Lynn Rea went to Austalia and played in several bands there.. More to come on this this lineup from Jack Howat and Pete McArthur. Watch this space. 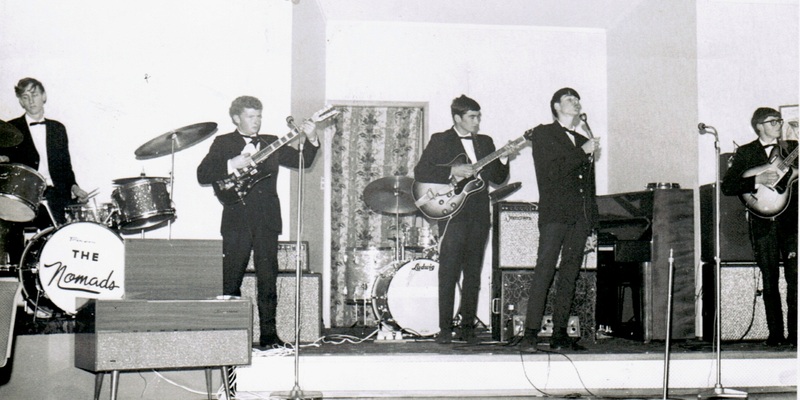 All in all, The Nomads Band was quite pivotal to the youth of Whakatane from 1960-1970 as much as they were home grown, all local boys, and became " a legend in their own time".